With the second Triple Crown in just four years on the line, NBC Sports Group is pulling out all the stops for coverage of this weekend’s 150th Belmont Stakes. 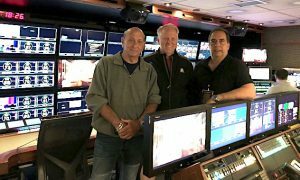 With Justify poised to capture the final gem of the Triple Crown, NBC Sports Group has boosted its production complement, adding a second onsite studio set, live pointer graphics to identify Justify on the track, and five additional cameras, including the Bat Cam aerial system that drew rave reviews at both the Kentucky Derby and the Preakness Stakes. NEP’s ND1 (A, B, C, and D units) mobile unit will once again be on hand to run the show, with a total of 43 cameras deployed — up from 33 for last year’s non-Triple-Crown race. Besides the Bat Cam aerial system covering the backstretch, the camera arsenal includes a Sony HDC-4800 4K camera (outfitted with a Canon UHD 86X lens) on the finish line, five HDC-4300’s running at 6X slo-mo and five more running at 60 fps, 14 HDC-2500’s (eight hard, six handheld), five HDC-1500’s in a wireless RF configuration (provided by BSI), a bevy of robos (provided by Fletcher) and POVs, and an aerial helicopter (provided by AVS weather permitting). Five other cameras have been added because of the Triple Crown possibility: a POV camera at Justify’s gate and one in the PA booth with announcer Larry Collmus (which will be streamed live on the NBC Sports App), a robo to capture a 360° view of the paddock, an additional RF camera roaming the grounds, and, most notably, the Bat Cam system. In addition to more cameras, NBC plans to use SMT’s ISO Track system to identify Justify with a virtual pointer graphic live during the race. The system will incorporate real-time data — speed, current standing, and distance from finish line — into the on-air pointer graphic, helping viewers follow Justify and other key horses throughout the day’s races. The Bat Cam was a hit at both Churchill Downs and Pimlico, providing a never-before-seen view of the backstretch and also coming in handy when rain and fog complicated matters for NBC at both the Derby and the Preakness. The two-point cable-cam system can travel 80 mph along the backstretch, running 15-18 ft. above the ground. Given the massive size of the Belmont track, the Bat Cam will cover more ground than at either of the two prior races but will not cover the entire backstretch. The system will run 2,750 ft. — more than 700 ft. longer than at the Kentucky Derby, 500 ft. longer than at the Preakness Stakes — of the 3,000-ft. backstretch. “The length of the backstretch was definitely a challenge in getting the Bat Cam unit [installed],” says Dekime. “But the benefit here as opposed to Preakness is that there’s nothing in the infield the way that it’s one big party at Pimlico. We are unencumbered, so that’s a positive. The length of the backstretch was a challenge in getting the Bat Cam units to cover most of the backstretch. Although NBC and the Bat Cam team were forced to bring in larger cranes at Belmont in order to install the longer system, says NEP Technical Director John Roché, setup and operation of the Bat Cam has improved significantly since the Derby. Besides additional cameras because of the Triple Crown potential, NBC Sports has also added a second studio set. Host Mike Tirico and analysts Randy Moss and Jerry Bailey will man the 18- x 18-ft. set at the finish line, and a secondary 24- x 24-ft. stage located near Turn 2 will feature host Bob Costas and other on-air talent. SMT’s Betting and Social Media GOTO videoboard will also be situated at the main set for handicapper Eddie Olczyk, who will use the interactive touchscreen for real-time odds and bet payouts for all races throughout the day. The touchscreen technology and betting touchscreen will enable him to explain and educate the viewers on how he handicaps specific races. In addition to the onsite sets, NBC plans to incorporate several live remote feeds into the telecast, including from Churchill Downs. Although the horse-racing gods have granted NBC the potential for a Triple Crown this weekend — and the big ratings that go along with it — the weather gods have not been so kind. After the wettest Kentucky Derby on record and the foggiest Preakness Stakes in recent memory, a chance of rain remains in the forecast for Saturday. However, Roché notes that the proliferation of fiber and the elimination of most copper cabling onsite has significantly reduced weather-related issues. Kristian Hernandez contributed to this article.